One of my all time fav place to eat is ChickFilA. 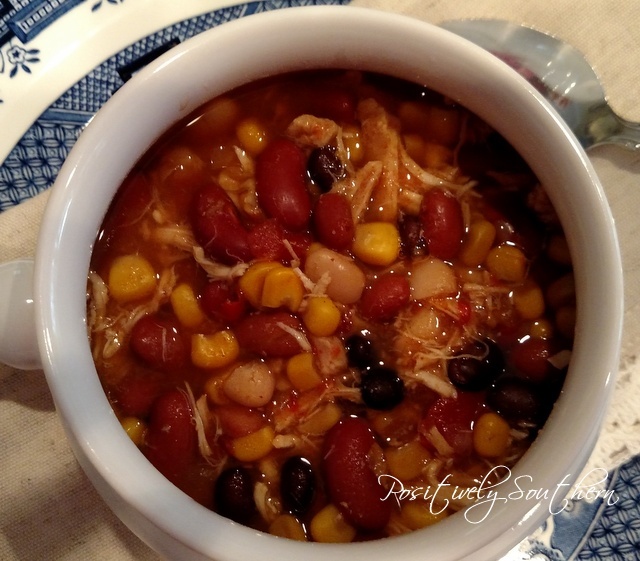 I'm especially obsessed with their chicken tortilla soup, it is delish! 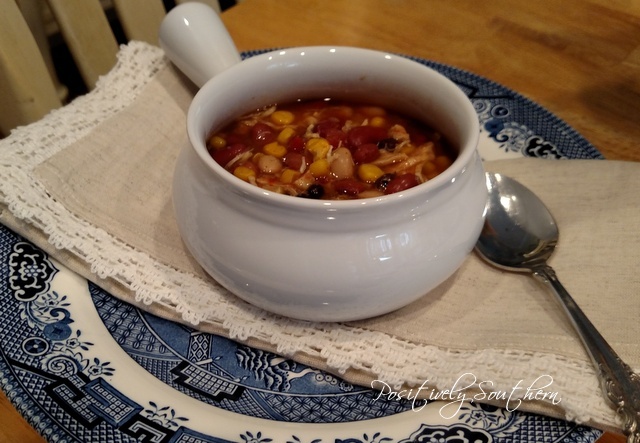 Since I am very fond of this soup I searched all over the internet to find a copy cat recipe. Ya'll there are plenty of them! There were so many that I got completely overwhelmed. I never saw one that fit the real description of what I was looking for so I stopped. As I looked at countless list of ingredients for anything labeled taco soup to chicken tortilla soup one thing keep bugging me. Why didn't I just combine similar ingredients and make up my own recipe?! So I did. Here is my Chicken Tortilla Soup. After tossing all the ingredients into the crock pot I place the chicken on top of the mixture. Cooking on high approximately 4.5 hours or until the chicken is fully cooked. If you use the tenderloins it will be fully cooked. After the chicken is cooked, I remove it from the soup into a bowl and shred. Then I return it to the crock pot and mix. The soup can be kept on warm until you are ready to serve. The kids like to crumble tortilla chips on top of the soup, it does make it yummy! Sour Cream pairs well on top as well. 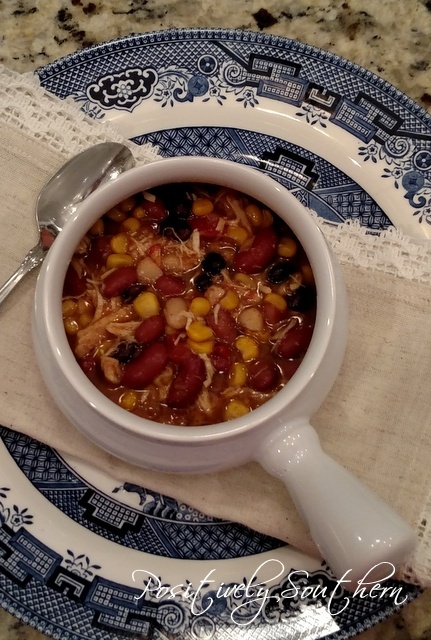 Any time I've taken this soup to a pot luck, it has always been a hit! It doesn't ever disappoint! Way back in January while recovering from the procedure on my esophagus my antique buddy took me over to the tent sale at Sweet Home Antiques. I found a few things (actually there were plenty) I wanted to bring home. This simple English Oak table was calling my name. It was perfect timing as I had already thought I'd like to replace the table that sat between the sofa and Honey's chair. 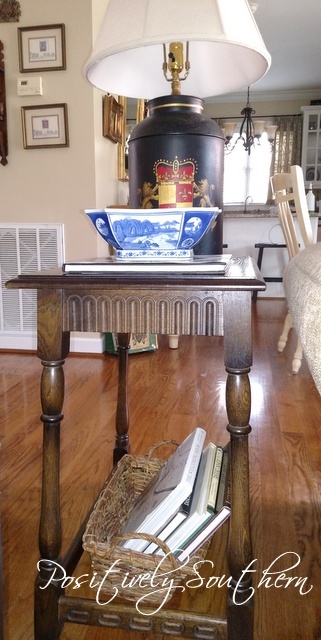 This side table is very similar in size and shape as the one that was in the same spot before. This table has beautiful carvings and the finish was a bit more polished than the one it replaced. The one thing that this side table doesn't have that the other did is a shelf on the bottom. I've improvised by using a basket filled with decorating books. Right about now I should confess something. This lamp is not plugged in, notice how the cord is tucked underneath the table? The reason for this is that we have no down plugs and apparently they are no longer up to code so we will never have a down plug.😒I've tried not having a lamp on the table but it just feels visually wrong. Can't wait to share with you all where the other table went! 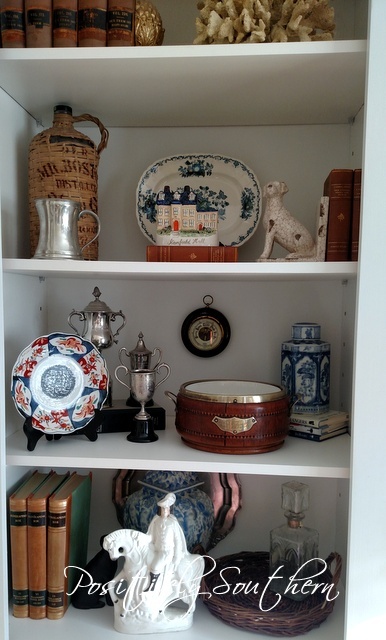 After my recent post on the updates in our living room, many of you reached out to me asking to see more of what was on the shelves and how exactly they were styled. So I thought I'd share how I decide what goes where and show a more up close look at those shelves. To catch up on that post catch up on it here. Here is an honest moment, when I first had these built ins built I just kinda tossed a lot of what I had on the shelves without a ton of consideration as to whether they all blended together or not. Kinda blah right? Very book heavy and it lacked any real visual interest. As I've honed my skills of rearranging, things have changed. To begin with, I pulled every single thing off the shelves, everything except the television! I needed to see it fresh, a blank slate. It has been a process. 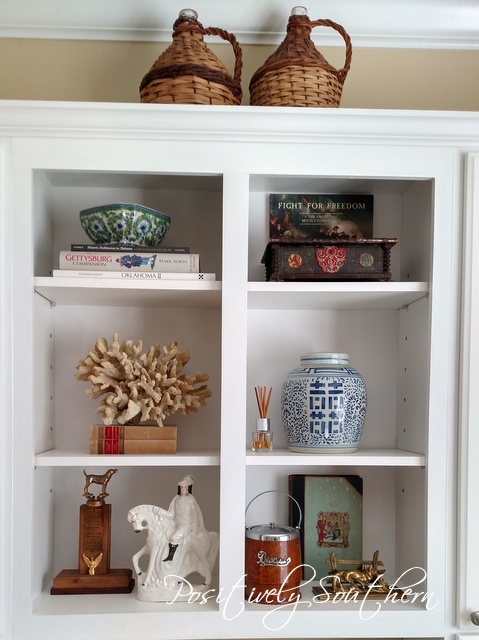 When I had a vision of how I wanted those shelves to look, I began to shop both stores and the house for the things I wanted. I knew I needed something that would add weight, so the process of getting leather bound books began. I've found them in all sorts of places. I gave myself a year to find and be able to purchase them. Most of the books were on average $10 each. 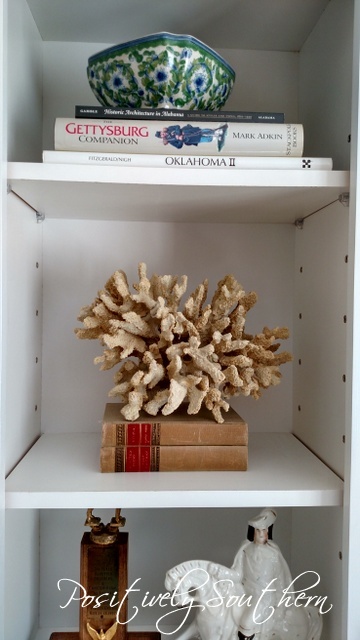 The faux pieces of coral were picked up at Kirklands about 4 years ago, they provide visual texture. There is nothing I adore more than Blue and White dishes of any description. I wanted some pieces but the colors in the living room don't lend to a lot of it. The antique black box is a really fragile piece. It dates back into the 1800's. 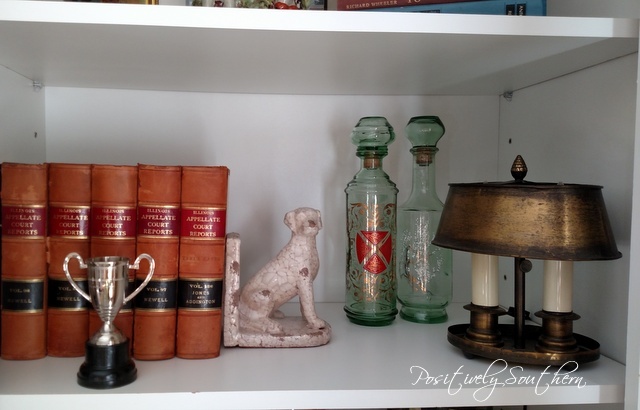 Of course there had to be pops of color so I tossed a couple of pieces of Staffordshire on the shelves. I do love when I happen upon a deal and I ALWAYS share that with ya'll. The Imari plate was seriously less than $15. I felt like I was stealing it, clearly the antique vendor didn't know what they had! 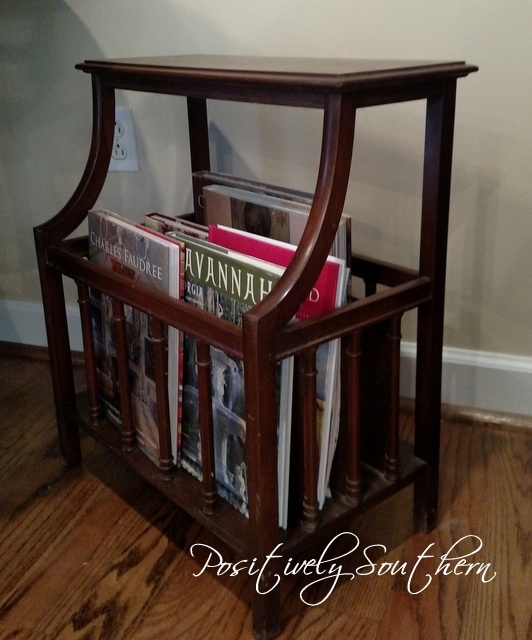 Using books is a great way to give height to pieces you might otherwise not be able to use. I do this all over our house! For now, I'm pretty pleased with how everything fits the shelves. 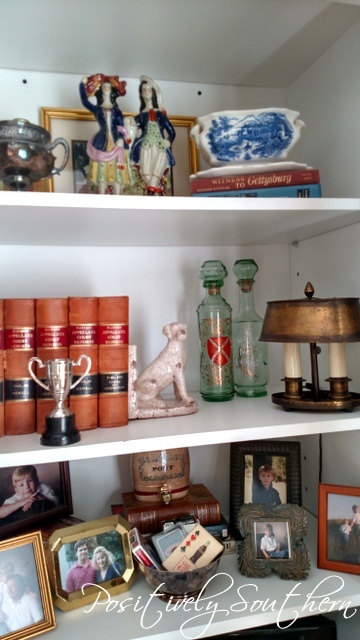 Last week I dashed to Birmingham to antique shop. I wasn't looking for anything in particular but of course I found a couple things. Anything with a crest or a shield is fair game! I wouldn't say this piece is a true antique, more vintage. I adore it! I have no idea what this was intended to be but, I've stuck a couple of decorating books in it for now. 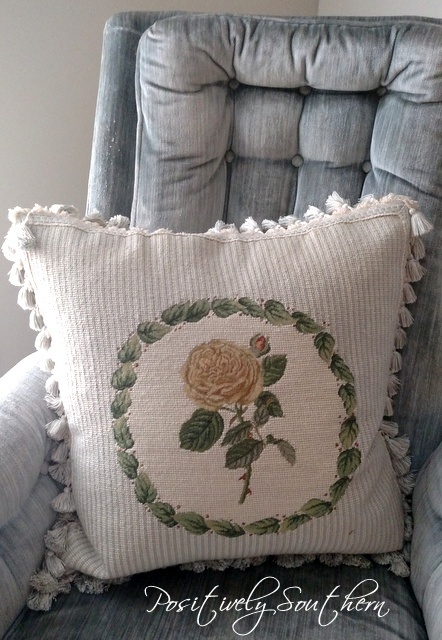 This pillow called my name. It has replaced the embroidered dog pillow that was in this chair. It is really large and should I find another that matches this it might move to a bed. This mount I picked up from one of the antique stores I frequent. 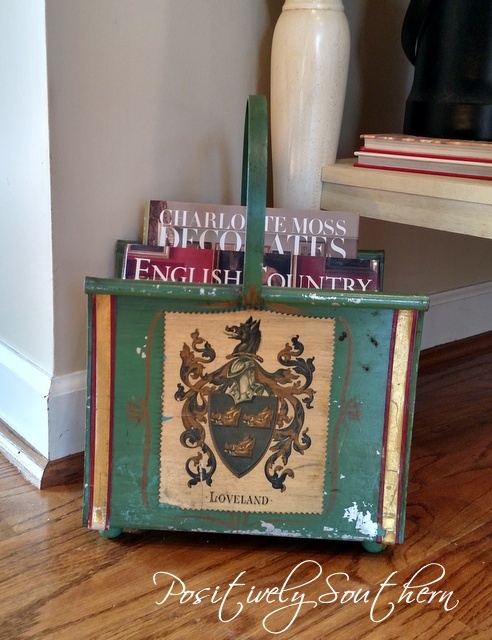 I saw this idea on Pinterest and thought it would look good at our house. 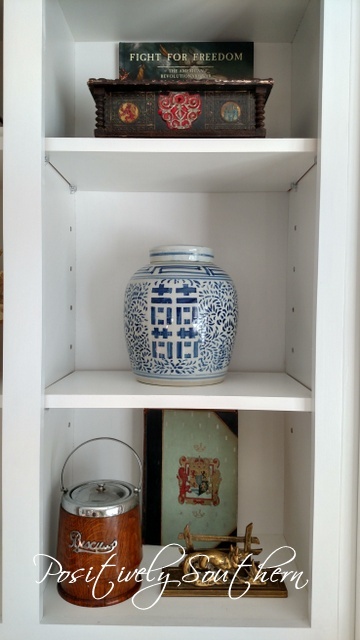 This wall vignette hangs over the door that goes from our kitchen in to the dining room. This winter I've tried to stay busy inside with just rearranging what I have. It was one of my short term winter goals. I've been fortunate to have picked up a couple new things that were affordable that I could add with what I already have. As in most homes, our laundry room sees a lot of action. It seems as if I am in and out of the room all through the day. Having updated the laundry room color a few years after we moved in, I decided it was time for a change. In case you wanna take a look at the before here you go. After painting over the blue in the dining room I must admit, I've missed having a blue room. 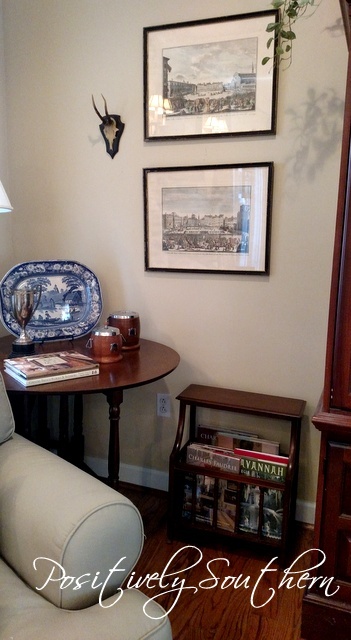 Pouring over the numerous options at Benjamin Moore, Nelson Blue was the color that won out. The room seems so light and airy....ya'll I LOVE it! The moment I saw the swatch of paint a coastal feeling swept over me. The baskets on the shelves are from TJMaxx, kinda hard to tell but they have a bit of a wash on them that lends to that beachy feel. The beach oil painting from my office made a move to the laundry room...for now. The colors in the painting go beautifully with the paint! If you are wondering what I have in those baskets I'll come clean. On the lower shelves, one holds all my fragrance items, like extra reeds for my reed diffusers along with other plug in scents and warmers, room sprays too. The other has my police scanner. Yes you read that right, a police scanner. For now the upper ones are empty. I keep the clear file box with a calendar on the front. It has things that need to be mailed along with a file for each of our boys. We have 3 cats so litter boxes are a necessity. Along side the litter boxes there is a drawer organizer that holds an assortment of what I refer to as "my tools." This is short for "they better not end up at the farm Honey!" See the odd little door to the side of the shelves? That is under the stairs storage, you will never see inside! Ha! It seemed like a good spot for a couple of my Alison Evan oyster plates. The oil painting over the laundry sink remains unframed as I have not made a decision as to how I want it framed, for 4 years! Seriously, it has been in the guest bedroom closet until I moved it in here. It never ceases to amaze me how a fresh coat of paint on something cant change your entire attitude toward it! Our coffee table serves many purposes, it plays host to supper, homework, a place for the cats to nap and most importantly a place to display some of my prized possessions. Since the coffee table wears many hats in our home I always have to consider this when I am styling it. I tried several different looks for the coffee table only photographing a few, there were many trials and errors! 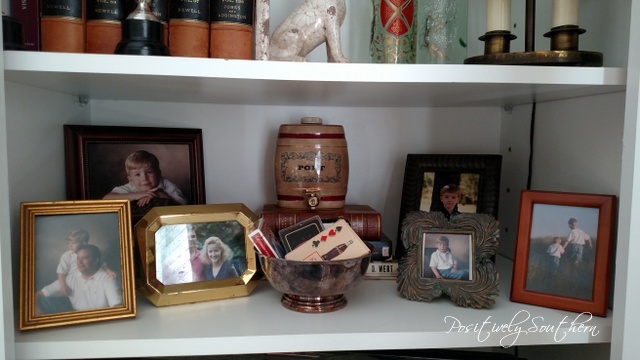 The brass tray that was on the kitchen buffet was rehomed to the coffee table and that provides the foundation of the decor. 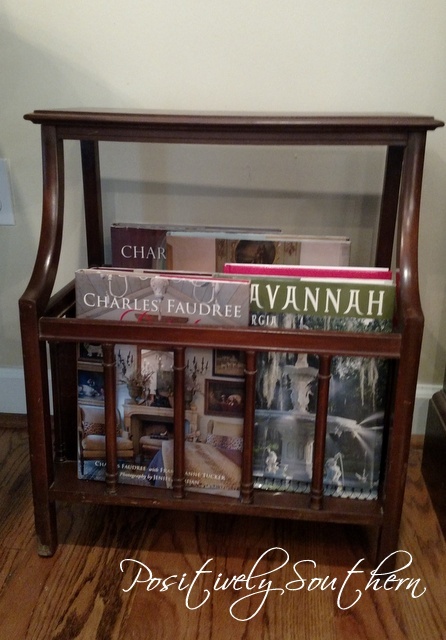 In addition to the brass tray the other constant for the coffee table is the stack of Charles Faudree decorating books with a magnifying glass. These are always on the coffee table so I can easily grab one and take a look. I tried the pair of mercury glass candlesticks along with an English biscuit barrel. Frankly, it just didn't work for me...I wasn't feeling it as my 16 year old says. The next look I tried was pretty close but still not exactly what I wanted. The Blue Willow soup tureen holds a piece of fern and brings much needed color to the tray as does the small piece of Staffordshire. When I removed the wooden candlestick and replaced it with a monogrammed decanter the heavens opened up and I heard angels sing...this was it! This tray holds some of my all time go to pieces. 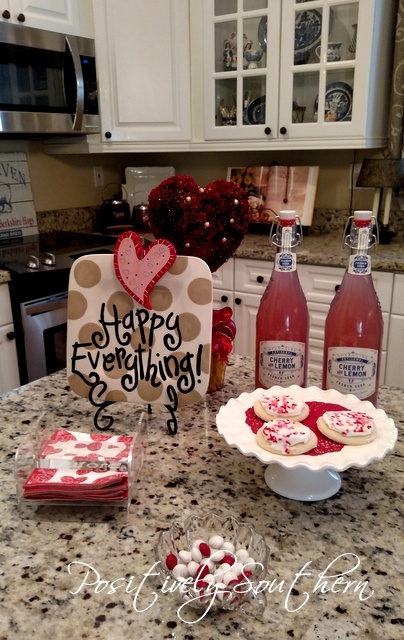 I've always enjoyed celebrating Valentine's day. When my boys were young I would just really go over the top. Now that they are 21 and 16 they aren't too into Mom doing much for Vday. They are pretty good sports and play along for my enjoyment. Just a simple treat makes me feel like I've still done something without going over the top that they wouldn't think was cool. I love to pick up these flavored sodas at the grocery stores along with a cookies. Years ago I'd have them both in the kitchen and we'd make cookies, decorate them. Do you still have children at home to make things special for, even if it is just something simple? Back in the fall I stopped by one of our local thrift stores just to meander around. Sitting under a display table was a very large magazine rack with a scuffed up top and legs, mostly it was dusty. When I saw it and it's $7 price tag I knew it had to go home with me. Forgive my lack of before pics, I get excited and just plain never remember to snap a pic. 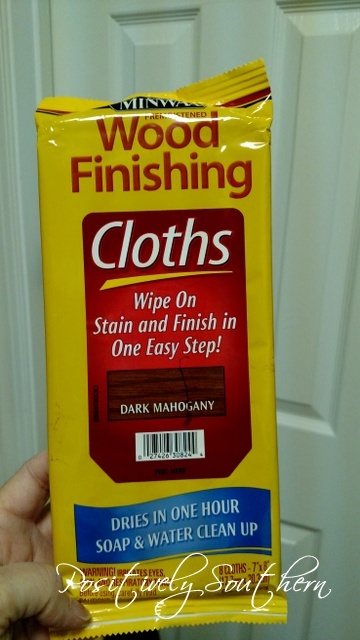 I knew that all it needed was a quick swipe with some stain and the top and legs would be fine. I received these Miniwax wipes ages ago at Haven and had never used them. Ya'll these wipes are incredible! I just wiped over the top and the legs and it was like new! In the photo below you can't even tell that the top had rings and scuffs! Isn't she a beauty?! The rack is very tall, above my knees for sure. She fits right into the family room decor and holds some of my decorating books. In case you noticed the new prints below, kudos to you! They are my new, old prints that I picked up in a antique booth for a sensational price at the end of the summer.